It is a well established scientific fact that people, on average, do not accurately report or record their food intake. In fact, most people tend to underreport the amount of calories they eat. The degree of underreporting can systematically vary based on a number of factors, including, but not limited to, weight, income, education, gender, and various psychological characteristics. The degree of underreporting can be quite severe. One study comparing obese twins to their non-obese twin counterparts indicated underreporting of 764 calories per day. Another study found certain individuals to be underreporting their food intake by over 2000 calories per day. Underreporting is also quite entrenched. In fact, paying people doesn't help them report their intake more accurately, and people will still underreport even when they know their calorie intake can be verified. There are three ways that people can underreport. One way is that they can simply fail to report all of the food they eat, misreport the portion sizes, or incorrectly describe the foods. The second way is through under-recording; the task of recording food intake can be quite tedious and people may simply not be diligent enough in weighing and recording all foods. Also, people may tend to undereat during short periods of time where they know they are being measured. A third way is that food labels themselves can have inaccuracies in regards to their reported calorie contents; in fact, some restaurant foods and some commercially available processed foods can average 8-18% more calories than what is indicated on the label or menu, and certain individual items can have over 200% more calories! How Can We Test the Accuracy of People's Reported Calorie Intake? Before the 1980's, scientists did not have an accurate way for measuring the amount of calories someone burns when in a free-living environment. Sure, you could confine someone to a room that measured the total number of calories burned (known as room calorimetry), but this is not relevant to a free-living situation (where the number of calories burned is significantly higher). Then, in 1982, came the publication of a paper that would forever change the world of nutrition and physiological science. This technique was known as doubly labeled water. With this technique, people drink water that has two stable isotopes. The elimination of these two isotopes from the body over time (usually a 1-2 week period) is used to determine carbon dioxide production. This carbon dioxide production can then be used to calculate the number of calories you burn. The doubly labeled water technique was actually invented in the 1950's, but its use was limited to small animals. It wasn't until the 1980's that technology had advanced enough, and that isotope costs had decreased enough, where it could be performed in humans. The method can accurately measure your 24-hour energy expenditure within ±5%. The doubly labeled water technique can be used to verify someone's reported calorie intake if their body weight is stable. For example, if the doubly-labeled water technique says you are expending 2000 calories per day over a 2-week period, and you report that you are eating 2000 calories per day, then you are accurately reporting your food intake (assuming you are weight stable). However, if the technique says you are expending 2000 calories per day, and you are claiming to eat only 1000 calories per day, then we know you are underreporting your calorie intake if your weight does not change. Well controlled experiments have verified the ability of doubly labeled water to accurately assess calorie intake. The doubly labeled water method allows us to determine whether someone is accurately reporting calorie intake. We know that the average person will misreport. But what about someone whose profession revolves around counseling people on their food intake? Researchers from the Pennington Biomedical Research Center compared the accuracy of dietitians' self-reported food intake to the accuracy of non-dietitians. The researchers recruited 10 female registered dietitians and 10 women of comparable age and weight who were not dietitians. All of the subjects were trained to provide a 7-day weighed food intake record. Doubly labeled water was used to measure energy expenditure over that same 7 days. Participants were told that the goal was to record food intake as accurately as possible. Most of the dietitians underreported their calorie intake, with one dietitian underreporting by nearly 800 calories per day, and another underreporting by around 500 calories per day. You can see the underreporting was definitely more severe among the non-dietitians, with a few individuals underreporting by over 1000 calories per day. I've often heard people swear that they don't eat a lot of calories but struggle to lose weight. However, the fact is that most people are very inaccurate in assessing how much they are really eating. 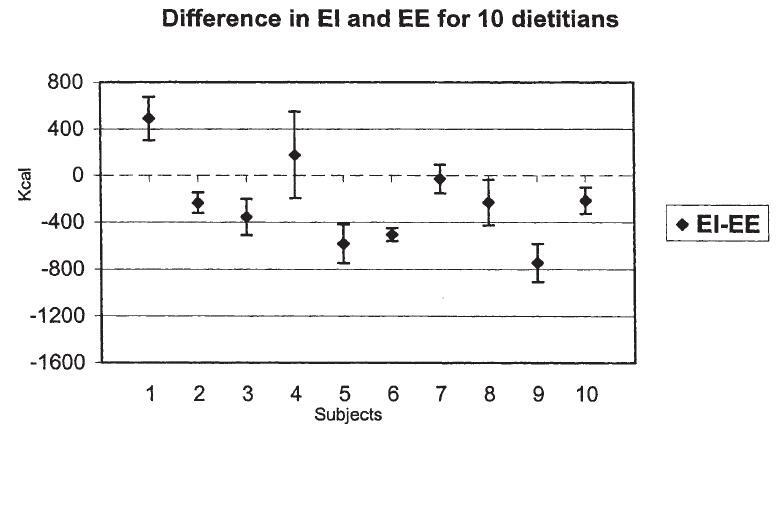 This study shows that even dietitians can be inaccurate in their food intake estimates. If dietitians can often be inaccurate, then the average person will certainly be that much more inaccurate. This study also illustrates why diets high in protein (whether low carb or moderate carb) are so effective for weight loss. It is well established that people spontaneously eat less when given high protein intakes; in fact, the spontaneous reduction in calorie intake can range from 440 calories to more than 1,000 calories. People end up eating less without counting their calories. There are no magical effects of lowering insulin or having a perfect "Zone" of macronutrients. It's simply a matter of satiety. REFERENCE: Champagne, C.M., et al. 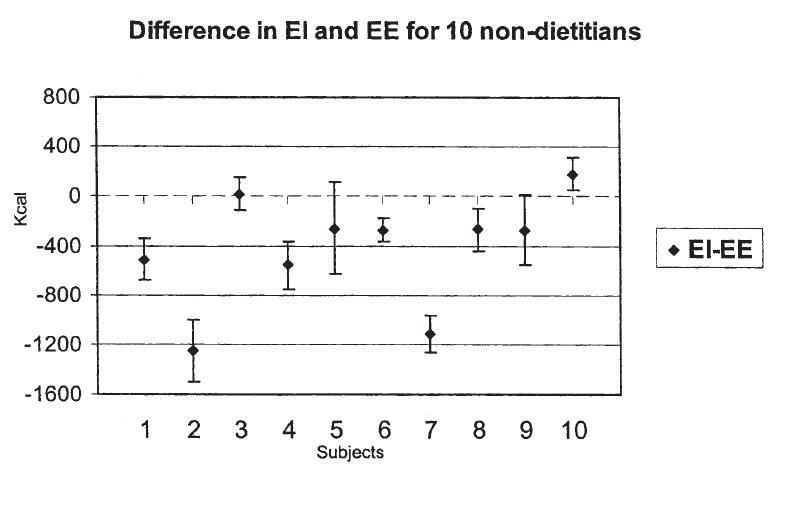 Energy intake and energy expenditure: a controlled study comparing dietitians and non-dietitians. J. Am. Diet. Assoc. 102(10:1428-1432, 2001. NOTE: I use the term "burn calories" to mean energy expenditure. "Burn calories" is actually an incorrect term as you can't burn a calorie; my past major professor would kill me knowing that I'm using that term. But I use that term because that's what the lay person uses to refer to energy expenditure. I’m going to call my clients damn dirty liars and then reference them to this article. James, you’ve enabled me to be a jerk to my paying customers. I keed I keed. However, hot damn about the dietitians under-reporting. They’ll be slightly less obese, so I guess that’s something. Haha, Skyler! Thanks for the comment! >> obese, so I guess that’s something. I doubt it. As a group I bet they’re much less obese because they’re part of the medical establishment in which I’m led to believe the social cost of obesity is very high. Less than for ballet dancers but more than the general public. Under-reporting seems to be a poorly understood psychological phenomenon. Though interesting that dietitians, whose profession it is to monitor this in others and presumably themselves, also exhibit such a large standard deviation in reporting accuracy. In this book, Stephen Johnson talks about inaccurately self reporting “Where Good Ideas Come From” from scientists as a flash of brilliance or a eureka moment when in fact, it’s a series of slow hunches that build overtime. This seems to give credence to the saying “I know you better than you know yourself”. It appears we don’t know ourselves very well at all. Interesting note at the very end about burning calories. As a matter of fact, my jr high physical science teacher made us all light different types of food on fire (i.e. crackers, marshmellos) claiming the BTU output was tied directly to the calories that food has, thereby having more energy to burn. In essence, we were literally burning calories. My impression of the colloquial expression was that it was meant more metaphorically than literally. Interesting, although not entirely surprising results. I count my calories to make sure I get enough. I’m 6’1″ 170lbs and I eat about 3600 calories/day, most of it is fruits and vegetables. I’m about 10% body fat. Yes, I exercise 5-6 days/week yesterday was a heavy exercise day and I ate about 4,160 calories. I think calorie restriction works somewhat, but longterm it’s not sustainable and not the best method. IMO a better strategy is trying to get ENOUGH calories of healthy food (IMO fruits and vegetables). I had a 1450 calorie 2L fruit smoothie for breakfast this morning. By getting ENOUGH calories of the healthy food, we crowd out the junk and are less likely to binge or give in to temptations. Anyway, that is my opinion and what works for me. hey, i’m on a 1200 calorie diet at the mmoent and my advice is that regardless of how big the portion size is as long as it is the amount of calories you are aiming to eat for dinner then its fine to eat. like yesterday i had a big bowl of soup that i bought from the supermarket that was 340 calories, it was a lot of soup but it was only 340 calories which is in my 400 calorie range. the reason they are large is because they are healthy foods such as vegetables, if you were to have a regular portion of this is may only add up to 170-ish calories because its little amounts of low calorie foods so to keep a balance they offer them in larger portion sizes. (i have a feeling that paragraph is confusing) so basically, as long as there is around 400 calories in your portion you are perfectly fine to eat it despite whether is is a large portion of a small portion.i hope your diet goes well! mines going really well, lost 7 pounds in my first week and a half! They say negative calorie foods are food that have very little calories and your body burns more calories consumming and diegesting the food that it actually has. there is conterversy over this topic but a lot belive it is true.. . It’s foods like cucumbers, broccoli, celery, green beans, ect…. They evn say apples and oranges are included in the list (wich to me is hard to believe because of the sugar) but it is exspose to be hard for your body to brek down thus burning more energy. . . Any body have any ideas?. There is some evidence that certain foods like celery take more energy to digest than what they provide. However, the effect is very small and not likely to make much of an impact on weight management. I was thinking: if the one worst dietician had been swapped for a different one who underestimated by a similar amount, the overall average would be very close to spot on. I think the real point is not that calorie counting is bad, simply that you should allow contingency if you’re doing it to try and achieve a weight goal.